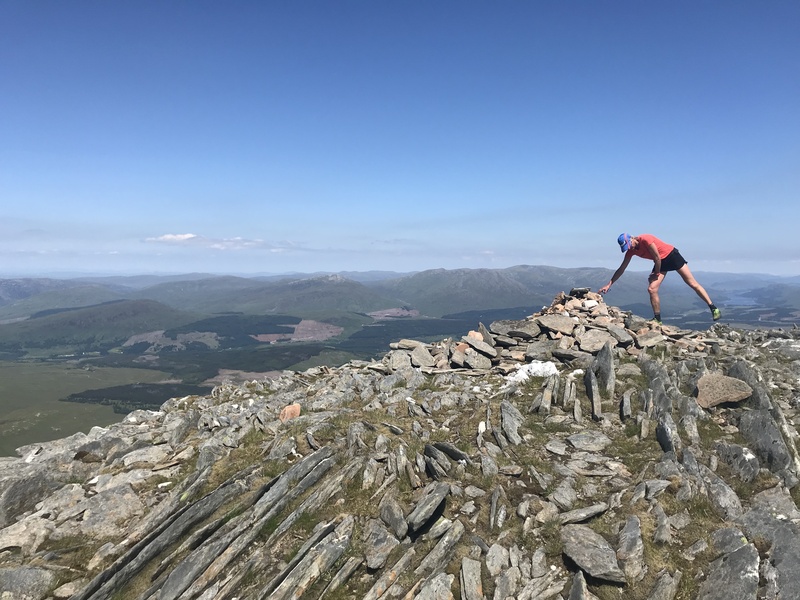 After the Double Bob Graham Round I fancied being the first to do something and the idea of a Double Ramsay crept into my head about November 2016. I contacted Charlie Ramsay because we had had conversations in the past about route variations, direction of travel etc and he said he wouldn't condone a Double done in the same fashion that I had done the BG. So I didn't pursue it any further as I respect Charlie's wishes and wanted it to be properly recognized as a Double. Over the next couple of months Charlie contacted me and said that he was willing to change the wording on his website to reflect a "Double Ramsay with variations" and this he did. Few people noticed this but every now and again someone would question the change on social media and I hoped no-one would guess I was working towards the Double as I don't like to be questioned and chatted to before my attempt so like to keep in quiet. My first recce was in July 2017 and I kept reccying throughout the winter although the snow was too deep and thwarted a lot of my preparations. We had some wonderful weekends away and I appreciated that I had the best friends and excuse to be back in the Scottish mountains. My fitness improved as did my route knowledge but on the day of my attempt I was concerned about some of the route as I just didn't know it well enough to run without map consulting. But there was nothing I could do - I had run out of recce time. The weekend forecast was dry but hot. Very hot. I don't like the heat but know I can manage myself in the heat. It was a dilemma whether or not to postpone because of the heat. If Sunday forecast was correct it would be cooler and overcast. I decided I could manage one day in the heat and sent out the email to say I was going for it. I had tried to get three good supporters per leg as there were only 7 legs and they were all 5 to 8 hours long bar one which was 3.30 hours. This worked and although I did have support I didn't know personally, I was happy with the numbers and caliber of support. I had Helen Rennard as a "valley support" - who would meet me 4 times over the weekend. This valley support was hard to work out logistically as the walk in and out was 3 hours long so I was worried that if the person walked in/out/in again that they would miss me. Helen agreed to stay in which was a huge commitment as it meant she would be there from 7am on Saturday to 5pm on Sunday. Charmian Heaton organized all the other supporters. This is the link to a pdf I made with the logistics and directions of travel on Logistics & Legs.pdf . Charmian worked out when and where people had to be. On a single round these logistics are complex enough but on the Double they were immense. I travelled up on the Thursday because I didn't want a seven hour drive then to set off on the Double. I didn't sleep well as the midges attacked me and it was very warm in the van but I slept in and got up about 9am. I sorted all my bags out and rested. My dad arrived after lunch and so I was able to spend some time with him which was lovely. Then Charmian arrived with Joss Naylor and after chatting I was able to rest up for most of the afternoon and evening. Joss asked Charmian whether he could come up earlier in the year and I was blown away by the fact that the Joss Naylor wanted to support me. It meant a lot to me that he felt that I could succeed and wanted to help. I couldn't sleep though as I was worried about the heat. Should I cancel because it was going to be hot? Saturday looked hottest at 26C then Sunday looked cooler at 20C with cloud cover and a good breeze. No I had to attempt. It was too good an opportunity. The rocks and the ground were dry which makes such a difference. At 10pm I went and had a shower and changed into my clothes to wear. 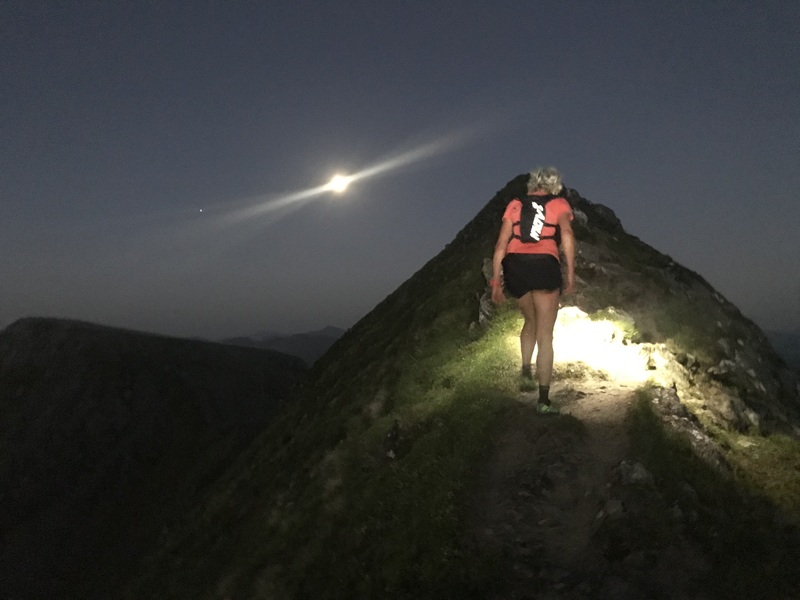 I had chosen my Inov-8 Tri-Blend Tee as I find the teeshirts very comfortable and easy to wear for hours and my Enso skirt because it has a multitude of pockets and is comfy. On my feet I wore a pair of Inov-8 Graphene mudclaws as I had tested a pair and were very happy with the fit and the grip of them. It was good to be off and I tried to run conservatively. I climbed well and when we were 10 minutes up at the top I thought I would slow it down a bit. This I did. I wanted to eat and drink a lot overnight to get "some in the bank" for later in case I was sick so I soon started asking for stuff like rice puddings, fruit salads. The next few tops went well and I realised that I wasn't going to easily make time on the schedule. This was slightly worrying especially as both muscles above my knees were aching in a funny sort of way. I hoped I wasn't still tired from the Great Lakes race two weeks before. I tried massaging them as I climbed but that made no difference. It wasn't a pleasant temperature as it was sort of warm and cold at the same time. I was hot but my legs felt cold and clammy. I really didn't want to put any leggings on and didn't think they were actually cold. The sun came up which was brilliant and well timed as we were just doing An Gearanach out and back ridge. It was a lovely morning. As we got to the end of the Mamores after about 6 hours I got a twinge in one of my knee muscles and realised that I might be dehydrated and getting cramp already. Damian had said he had some salt tablets so I took a couple of them. We found a nice line off Binnean Mor and climbed the horrid scree of Binnean Beag. I wasn't looking forward to the climb of Sgurr Elide Mor but actually it went well and I was chuffed to reach the top about 20 minutes up on schedule. I like the ridge down and it was nice going. The sun reflecting off the water made it hard to get the line to the Track bend and we couldn't see anyone there until we were nearly on top of them. Helen had got everything prepared and I had some tea and coffee and tried some noodles. I think because I was eating well I didn't feel hungry. I wasn't looking forward to the valley run at all. Wisp had also walked in with the Leg 2 support and was bouncing round all ready to go. We set off and the vegetation was quite high and so we walked a lot. The river was low but I managed to get quite wet. The pace felt easier than I expected but pleasant, There were a lot of clegs flying about and biting us which were unpleasant. It was annoying to realise that we had lost 10 minutes on the track when we got to the Railway Bridge and so I upped the pace going up Beinn Na Lap. We found then lost the atv track but as it was so dry it didn't matter. I was still eating and drinking well. Brent had dropped off the pace but was only carrying my clothes bag so I still had Jim and Pez with food and drink. We gained 5 minutes back to the summit which was encouraging as I wasn't out of breath or pushing too hard. Running off Beinn Na Lap I was thankful that I had spent so much time finding the route off. Even though we could see I knew it was best to stay high for a lot longer than you thought before dropping. I was enjoying the descent on grass instead of rock and made time to the valley bottom. Unfortunately we lost Jim on the descent but we thought he could catch us by missing Chno Dearg. I had seen on Jasmin's track that there was a more direct line and although I hadn't reccied it, it looked good from the bottom so I headed up early. The climb was ok and we were soon at the top. Pez was trying to do everything now being the only supporter; feed and water me! So I tried to ask for everything at once to minimise the number of times he needed to stop and delve into his rucksack. I had eaten all my food he had for me though and was now eating his. More time was made on this climb. 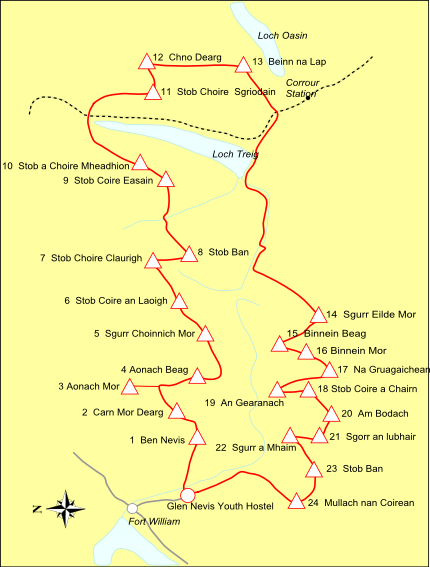 In all the reccies I had never found one continuous path from Chno Dearg to Stob Choire Sgriodain but I knew the general line well. Today though we trotted along, always on a good path. We couldn't see Jim anywhere in front or behind. I hoped he was in front to show us a way off. Again on reccies I had been up and down Sgriodain a number of times and wasn't happy with my descent. I knew where not to go - but not where to go! Again the route down just seemed to flow. We didn't get stuck above any crags and kept jogging downwards. It was a joy to reach the bottom and into the forest. Wisp had been getting quite hot and although I had intended for her to do the next leg I said to Pez that I would leave her at Fersit. I was hungry and ready for some food but when I reached the campervan we surprised them as we had made up more time and so nothing was ready. The clegs had driven everyone inside the van and it was full of people and hot inside. I sat for a few minutes while Charmian tried to rustle up some food quickly but then decided I might as well do Leg 3 then have a feed. I wasn't looking forward to the very long, hot climb of Stob A Choire Mheadoin but there was no putting it off any longer. I set off steady looking forward to catching Joss Naylor who had already set off with Dave Pickering. It was hot but I climbed well looking forward to getting back into the breeze. I didn't feel the same as on the Double BG here. The rest of the round wasn't daunting even though I knew it was hot and going to get hotter. In the breeze it was pleasant. My stomach wasn't too happy though and do I had fruit salad which didn't help. I was annoyed at this as it had been very good and I knew I had to sort it out. Thinking of all my things I eventually decided to try a Brunch bar. As soon as I ate this I felt better and had some crisps as well. We met Joss and exchanged a few words on the way up which was lovely. I didn't think I was climbing well so I was surprised we made time on the schedule. 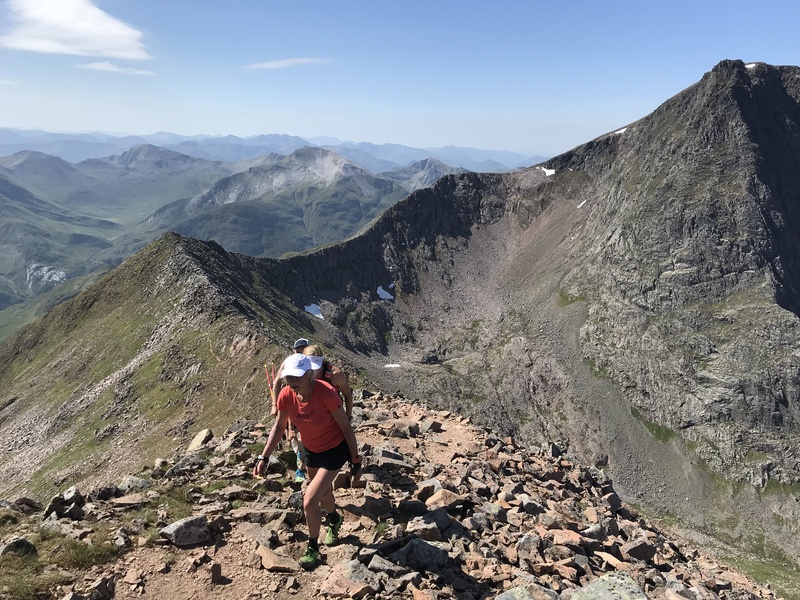 The run to Stob Coire Easain was something I had been visualizing for months and it felt easy. I touched the top and had a quick look at Stob Ban across the valley, knowing it would be 24 hours before I returned that way. This thought didn't faze me though. We ran down to Fersit in good spirits. I approached the van and couldn't see Wisp. I went inside and asked "Where's Wisp?" Charmian said she had been too hot and that she had gone back to the campsite. I don't know why but this upset me. I just felt guilty at bringing her and then abandoning her. I felt teary but van was full of people and really hot. I sort of didn't want to leave without Wisp. I knew it was unreasonable of me. I tried to eat but I was too hot really so I ate the potatoes which tasted nice especially covered in salt. Pez had rested and was good to set off again so it was time to brave the mid afternoon heat and get the big climb of Stob Coire Sgriodain over with. I set off with Pez and Tim and immediately couldn't find the way through the woods. I wasn't concentrating. I felt very low and was missing Wisp. There was nothing to be done though so I plodded upwards not really finding my decent line and straight lining it really. As we were climbing it got very hot and Tim dropped behind and then out of sight. Me and Pez carried on glad that Willy Kitchen had set off ahead with some more food etc. We were both puffing away in the direct sunshine however on reaching the plateau I realised we were on schedule for the split which was amazing and gave me a boost. I hoped the other splits would be as good. Willy was on the summit and in good spirits. He said he would give stuff to Tim to catch us at the railway bridge. This meant it was tough for Pez on his own but we worked together with me not asking for too much. The descent to the river was nice however then came the hottest climb of the round so far. Wow, upwards through the deep heather with the horrid clegs buzzing and biting us. We couldn't stop because they were worse then. I knew that Charmian had made the right decision about Wisp; it would have been so hot for her on this return leg. At least when we got to the plateau there was some breeze and once again we did the split time so I was happy as although I was out of breath I wasn't pushing hard. I was really trying to just maintain pace without overdoing it and hoping that I could make time once it was cooler to allow for longer stops, delays and a sleep if needed later on. 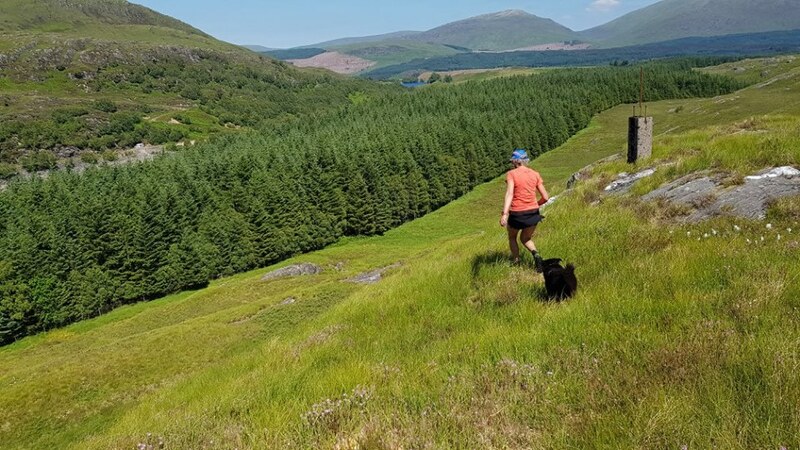 Off Beinn na Lap we ran finding the lovely lines and enjoying running on soft dry grass. We lost the track in the bottom but never mind. Tim was at the bridge but I didn't need a stop. I have always hated the "valley run" as I call it and was determined not to lose the time returning that we had lost on the way out. I ran strongly but knew I should be eating so asked for some beans and then found some shade in which to eat them. I was also drinking quite a lot of coke and of course water and my energy drink with Zero tablets in. I was so glad I had put a load of Inov-8 soft bottles in. They were proving invaluable now. Tim was struggling with the heat again (he had been sick already) and also the clegs were biting him a lot so he dropped back. The clegs really were awful and I took my cap off so I could swot them. They really seemed to delight in getting you in awkward sore places like on the insides of your thighs. We reached the Track Bend where Helen and Leg 5 support were waiting with Wisp!!!!! I was so pleased to see her again. She seemed happy and bouncy. Leg 5 support said she been back at the campsite sleeping and eating all afternoon. Now she could do the cooler night leg and then we'd see about Sunday. I didn't stop for long because the clegs and the midges were out. I asked for noodles and my Expedition Foods Apple and Crumble pudding to be brought along as I could eat them on the move. I was still wearing the same clothes and shoes that I had set off in but my feet felt comfortable so there didn't seem any point changing. I made a mistake in not asking for more clothes to be added to my bag - I think it was because I was so keen to get running again away from biting insects. But we set off in good spirits along the track with Wisp bouncing along and me chatting and eating well. Whereas on the Bob Graham I had started feeling badly on the night section this didn't really happen. We climbed well up Sgurr Elide Mor and off across to the col between the Binneans where I knew Ian Fitzpatrick was waiting with a tent in case I needed a sleep. I sort of didn't want to sleep but when he put a sleeping bag round me I hardly wanted to move. I coudn't eat any noodles but managed something. Really my eating had been good. During the day I was on fruit salads but then after Fersit went off them and tried bakes beans but they were claggy and so I'd asked for rice puddings. I was getting those down easily and along with crisps, cheddars, Brunch bars and the odd Tunnock wafer bar I felt good. I had the odd gel when I thought I had a big climb coming up too. Noodles I had a lot on the UTMB and so had the support make them up and then carry in a Pour & Store bag. So after sitting there for a bit listening to Ian rave about his journey up to the col - he'd brought his bike!! We had to go. The way up Binnean Beag was much nicer on the path and then the way down was a bit horrid on the scree. I think it's too dry for the scree to stick together at all and we all slithered on the top of it. Wisp doesn't like scree either so she slithers down very close behind me and doesn't bark "rock below" when she dislodges everything down on to me. But it's a small price to pay for having her come along. The climb up to Binnean Mor I hadn't been able to recce as it's north facing and retains snow as late as possible. But remembering the line from my 2014 record run we made our way up. It was quite a good line and everyone was pleased with it. We reached the col early though and so had the proper scramble to do. Wisp is quite happy now scrambling. When she knows she can't get up something she goes in front of me so I can push her up. We work together as a team and she scrabbles as I push. She went in front of Dave though and I told him to push her up. I think it took her by surprise as Dave is stronger than me and she was catapulted up the rockface!! She turned round with such an indignant look on her face that I had to say "Don't look like that just because a man touched your bottom, he was only trying to help!". 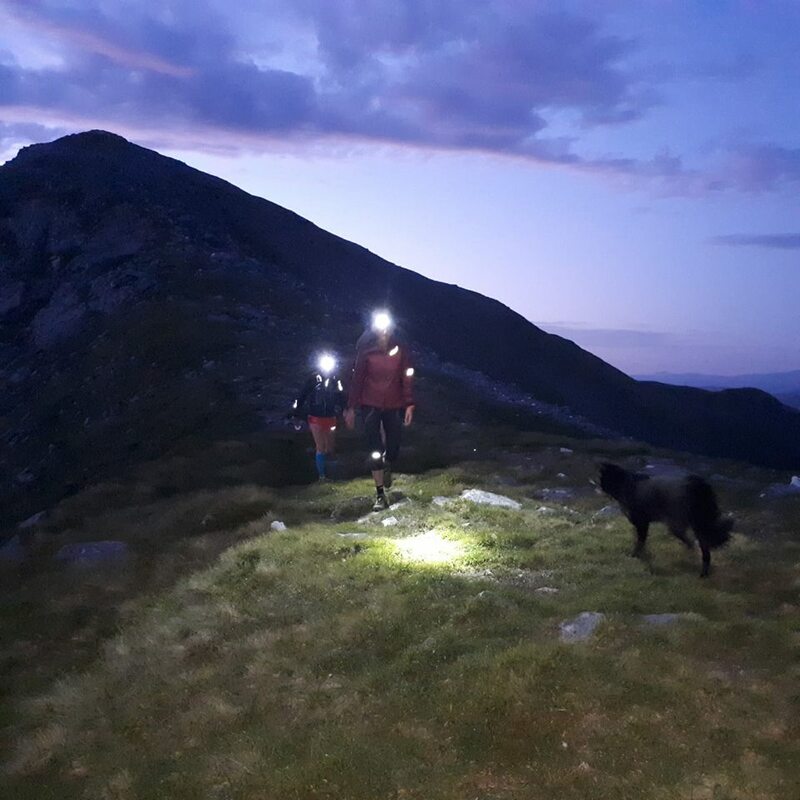 Along the Mamores, ahead of schedule, we then lost time on the splits because we were running in the dark and not the light. This I had known was the danger of getting ahead of the schedule but still it was worrying and what with the lack of sleep I lost my impetus. Between Am Bodach and Sgurr An Lubhair I stopped and said I wanted to try a sleep. My support sat down next to me and I curled up on the mountainside with a jacket over me. I shut my eyes but sleep didn't come. I was listening to the support chattering and it was annoying. I was annoyed at myself for wasting time. I looked across at the amazing sunrise across the Ben and thought "What are you doing feeling sorry for yourself? You don't need a sleep. Just get up and get on with it". So I shook off the jacket and said "I can't sleep" "Let's go". I started off at a good pace. Nothing stupid but more like what I was doing all day. Running bits and walking strongly. It felt good. We passed Sgurr An Lubhair and trotted along the ridge to Sgurr A'Mhaim where I was pleased to find we had made time. Back along the ridge and down to the loch. I carried on while the others filled the water bottles. Trotting along, I felt happy now. I climbed Stob Ban and was amazed to have made about 10 minutes up. Everything seemed good. Glen and Helen were with me but I had dropped James and Dave with my pace increase. Wisp was of course keeping up! 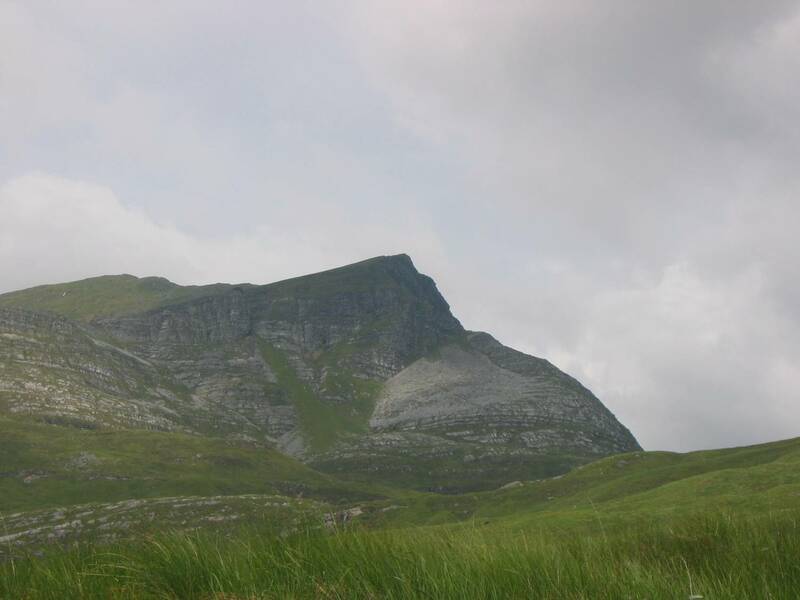 We trotted along to the last return mountain; Mullach Nan Coirean and down the long descent that I have never enjoyed. Today though it was dry and Glen was just gently finding the nice lines. I looked across at the Ben and although it loomed I felt ready to tackle it. Running along the road with Helen I was ready for the next leg. Steve Wathall needed the tracker and so exchanged that while I had a few words with Charlie Ramsay and my dad. Then I was inside the camper having breakfast of eggs on toast. As usual I didn't want much but everything I ate went down well. I wanted "noodles to go" as I had been getting them down quite well along with rice puddings. Again I started to feel dozy and Charmian said I should try sleeping. I lay down and all was quiet. I don't know why but I couldn't sleep. This is how I imagined me trying to sleep would be but on the BG it just happened. It wasn't happening now though so I got back up and made a move. I took my Leki Micro Trail Pro-carbon Trekking Poles and set off trying to get into a rhythm with them. Majka was straight on trying to get me to drink and initially I did but then my stomach was full of water so I stopped and asked for some food. The annoying thing about poles is that you can't eat and walk with them but this was vastly outweighed by the benefit I felt using them. On one of my reccies I had practised with them and knew when I was tired they would help. We talked about the route up - whether to take the direct line or the path. We all thought the direct line would be best. I was climbing ok I thought but it was getting a little hot and unlike Saturday there didn't seem to be any breeze. Leaving the path to go up the left of the Red Burn was good, We climbed towards where Willy was waiting, having reccied the direct line. As soon as we left the main path on the direct line though I found it very hard. It was very steep and the scree was loose. I had to keep weighing down on the poles a lot and got very hot. I was frustrated and angry at the route. It was so hard to walk properly without slipping backwards. I was so glad to get to the top and across to the cairn. We had lost all my advantage on the schedule and were now just on it. Dropping down to Carn Mor Dearg arete we didn't find a decent way and were on all the large, loose boulders. Because I wasn't in front I couldn't lead. We then carried on and then I realised we had missed the turn off point for the little contouring path to what the locals call "the chicken run". I shouted and headed down. We found it and went along it. I knew all this messing about was costing us dearly. It seemed to take forever along the arete and up to the summit where Lee Proctor was waiting. I wasn't in any mood for chatting and think I probably gave him the "death stare". I was feeling low, having lost 15 minutes on the schedule, with only the prospect of a long, very hot day ahead of me and little chance for making time up. We left Carn Mor Dearg and I went in front and found the nice way down to the col. Up along the stream and onto the path that had got really eroded over the winter. Here I really started to struggle. Again just leaning on the poles in the heat and on the steep sandy path. I felt the time slipping away. I didn't know what to do. Getting onto the plateau there was a slight breeze and we walked strongly to the top. But more time lost. The support were worried. I was worried. I was just too hot to do anything about it. We decided that it was "damage limitation". We would continue and make sure I was eating and drinking. Majka's nagging had paid off because I was going to the loo a lot and was well hydrated. Then when it cooled down on the return leg, where I also knew I had loaded the spare time, we would try and make back time. I felt ok but just hot and got out of breath very quickly on steep climbs. Along we went. Down off the Anoach's using Spinks Ridge (see photo on right) to descend onto the Grey Corries. Every climb was baking hot and I didn't dare look at the schedule but knew were losing about 10 minutes per split. My feet were also starting to give me jip and we stopped a couple of times to try and sort them out, putting on new socks and applying vasaline. Lawrence said there were no blisters but that the feet had swollen up having been wet and then hot for a long time. When we got to below Stob Ban we should have been at the Hump. We all thought we were 1.30 hours behind schedule. That was ok. I liked the big climbs ahead it should get cooler soon being 4.30pm now. As we descended we thought we could see a tent but no people. Maybe they are all inside the tent hiding from the midges. As we got nearer the tent wasn't a tent but a patch of grass. Where were they? Behind the Hump maybe? We got to the Hump and there was clearly no-one there. We couldn't believe it. There was no note, no evidence that they had been. What had gone wrong? We were behind schedule and they had no signal to see the tracker but why would they leave? It really floored us. Anyhow - I said "I want to carry on". "What food do we have?" Majka said "We have enough food". I was unsure of this but they reassured me. I thought "Whatever we have, we can manage". Lawrence said he was waiting at the Hump while me and Majka did Stob Coire Easain. Alex had planned to summit Easain and then run to Fersit but also waited with Lawrence. Me and Majka set off. I was running through in my head what we needed to get back to Fort William and realised we probably didn't have enough head torch's. I asked Majka. "No the support were bringing head torches in." 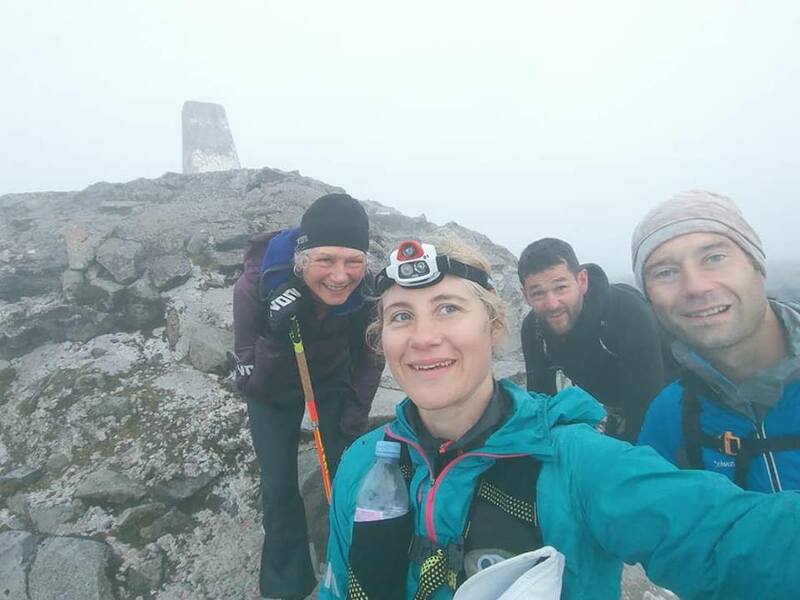 I knew there was signal at about 750m on Easain so when we got there Majka phoned Charmian to ask for head torch's to be brought to the base of Spinks Ridge at the end of the Grey Corries. Charmian answered and I heard her say "The support are coming back and will be there when you get back to the Hump". This was a massive relief. Up Easain I had pushed the pace a little and we made back some time on the climb. Running down I was glad that the support were there as I would change my shoes from the Graphene's to Roclites. This is probably one area I'm not an expert - feet. But changing my shoes on the Bob Graham helped and so I thought it might now. Back to the Hump and the support. I said I wanted 3/4's and warm tops and waterproofs. There weren't any waterproof's to be found. My Green bag had only my spare head torch battery, 1st aid and hat and gloves in it. I couldn't understand where the clothes were. Helen had had a full bag with warm clothes in it. I took two windproofs instead of a waterproof but wasn't happy at the lack of warm clothes. Anyway I changed my shoes which felt better. We put some Compeed on the sore spots. I ate some noodles and asked for the pudding to be carried. Jon Gay then said "It's nice, that pudding" - he'd obviously been eating it which I found amusing! Feeling slightly unprepared for the long leg ahead we set off. Majka said she wasn't returning because she thought I would drop her. I said "I won't drop you, you are coming with us". And she turned and ran to Pez to get sorted! I was so glad she was coming back with me. We have been through a lot of long reccies together and I wanted her company. We climbed well and I felt happier. Getting to the top I think we had made back some minutes although it was hard to tell with the stops etc. My feet felt slightly better although I still had sore spots. I wasn't too happy with the shoe change I think the Graphenes might have actually had more room for my feet inside but it was done now. I found I could trot along which was nice. Off Stob Ban some clag rolling in which then enveloped us and Jon was studing his map. "Great" I thought, "Now we have to navigate. How the hell are we going to make up time now? ".We were the wrong side of the lochan heading down the wrong valley. We turned back and went round the correct side and climbed Stob Coire Claurigh losing 10 minutes in the clag. It all seemed stacked against us. To Stob Coire An Laoig we were very slow in the clag. Even though I had only just come along the ridge a few hours before it looked completely different. We had to summit all the false tops and I wasn't surprised to find we had lost more time to Laoig. Coming down to the col Jon was map studying trying to find the pink scree. I said "There's some scree and it doesn't really matter which scree we go down. We will end up in the basin". Eventually we agreed to descend the scree. Setting off Jon was crossing to other scree - we couldn't see the basin at all below. I looked up and tripped straight away. It was scary, as I fell headlong, I saw the sharp scree coming up to hit me in the face. I rammed my left hand down into the scree and just caught my chin on the rocks. I was face down on the rocks and upsidedown. Majka was just behind and started questioning me "I'm ok Majka, I just can't move". I felt myself being lifted straight up and then I was stood. I moved my limbs and found that I was ok. There was a bit of blood about but I was ok. We carried on descending and I realised there was lots of blood dripping from somewhere. I looked at the palm of my left hand and saw a gash. "I'm going to have to treat this" I shouted. We stopped in the basin and got out the 1st aid. I had plasters and tape and we bandaged it, with Jon doing lots of fussing even though Majka is a doctor! We couldn't see the next mountain and Jon got a bit confused. I realised that even though he is the local, living in Fort William that I actually knew it much better than he did. "We just have to head right to the col and we'll find the path up" I said. We did that and found the path. I was getting cold and asked for my top. Unfortunately something had leaked and it was wet. I put on my Dark Peak vest and another windproof instead. On we went. I think I knew now that there was little chance of making time up. We were jogging every now and again but not enough. My feet were getting worse and we were now approaching darkness. It was ok though. I wanted to finish and I could finish. I was still eating anything and everything, I was getting bored with having to eat the same food over and over but I was able to eat and didn't feel sick or anything. Contouring down to the base of Spinks Ridge we thought we heard a whistle so whistled back. Harvey had stopped to get my 3/4's out so then repacked his rucksack and caught us up. It was Joe Mann and Kay Andrews waiting for us at the bottom of Spinks Ridge. How amazing!!! He asked if we needed water and we didn't. "Have you any warm clothes?" we asked. He hadn't brought any with him but immediately stripped off his jacket. I took my windproof off and put the lovely warm jacket on. Oh it was bliss!. I asked for my 3/4's and then Harvey couldn't find them. I'm sure I had seen them before and think they are now somewhere on the ridge in the Grey Corries. Jon gave me his waterproof trousers instead. I dug out the hat and gloves, giving Majka one pair of gloves. I asked for my head torch and plugged the battery in. A red light showed up which meant it didn't have much charge so I put my spare battery on my light and the light was green but I knew this battery only lasted 2 hours. I swore a lot but there was nothing I could do but hope we had enough light between us. Kay had taken off her fleece and gave that to me too. I put it in my rucksack. Majka was still cold and then Joe said "You can have my trousers" and just whipped them off!! It was bloody freezing and there he was in his underpants! I said "Are you going to walk off like that?" picturing him walking down Glen Nevis in his underpants! He said he'd got some shorts and Kay fetched them for him. Majka put his trousers on and they fitted well. Right - now we were sorted and could get off. I have been up and down Spinks Ridge a few times now and knew it quite well. Initially when I first descended it back in 2008 on my first Ramsay Round - it had been unplanned and only came about because there was a big bank of snow filling the rock that I used to scramble underneath. I had looked over the edge and just said "I'm going down there" scaring my support half to death, because it's very steep at the top. The week after I did that Digby Harris attempted the Ramsay and in his report he said he descended "Spinks Ridge" and much to my delight the name has stuck and even walkers are calling it that now. Charlie Ramsay once said I had to ascend and descend it before I could name it after myself so I duly completed an ascent of it as well. Approaching it we just kept coming across banks of rocks that looked like it but in the dark and clag we realised we hadn't gone far enough yet. I said to Jon "maps don't make a lot of sense of the ridge being that the contours are so close together that it's really confusing to read any features, but if we just keep heading to it, I'll know where we are when we hit it". And I did. We just went right a bit on the grassy ramp, then zig zagged up until on the ridge. The only tricky bit then is the final climb to the plateau. I felt strong and enjoyed the climb. We all knew it was just going to be a very long night! Strangely enough even though I was now going through my third night of no sleep I didn't feel zonked or spaced out at all. My feet were killing me and I was not looking forward to the long long descent of Ben Nevis. Lawrence had said that as a last resort he used to take his socks off and I thought I would try that. It did feel better although of course I had to keep stopping when too much grit got in my shoes. Off along the Chicken Run again. Up to Ben Nevis - this time deserted! Touching the top Majka said "Lets have a selfie" and so we did!! I was dreading this descent now. We tried the direct line but I fell about three times. I just couldn't stay upright on it and was scared of bashing my sore hand. So back to the main path we went. Oh that's better. A nice stroll down a well made path. We took the Red Burn big short cut though and could see people there. It was Steve Wathall, Dave Pickering and Joss Naylor. They had brought Wisp too!!! She looked happy when we turned downhill - even she was ready for home! Everyone said she had just slept and ate for 24 hours. I loved chatting to Joss and hobbling down with him in the sunshine. We met a few walkers coming up and I think the sight of me in agony made them wonder "Just how hard can Ben Nevis be?". A few congratulated Joss Naylor for getting to the top which made us all laugh. Lee Proctor was waiting and asked was I ready to run across the bridge? I hadn't planned on any running to be honest but woke up to the fact that I had actually just completed the first ever Double Ramsay round and as such should celebrate at the finish line. He asked what I wanted to eat and as me and Majka had been discussing this (for hours!!) I said a Double Breakfast! He ran off to get it ordered! Charlie Ramsay was there to take photos and then I broke into a jog across the bridge and down to the fence where I had started. Total time 55 hours and 56 minutes. 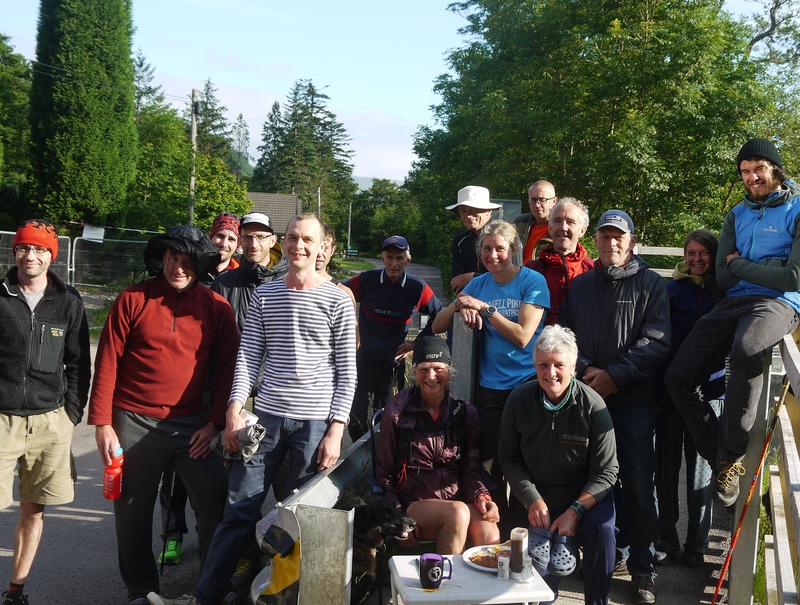 The full breakfast was there waiting for me and it was great to stop, take my shoes off, have congratulations from everybody and hugs from Charlie, Charmian, Joss and my dad. I sat and started to eat but there was too much going on and the midges were biting so I moved to Jim Paxman's van. I was joined my Majka and we both had a breakfast apiece. A fitting end to a very long day. One Week Later - My legs are fine and I have been for a run already. I can't believe that four days after doing 46 Munros (and two near Munro's), 122 miles and 15,268m climb that my legs can be so good. No muscle soreness, no injuries, no niggles, nothing. Just six blisters and huge feet. That in itself is annoying as it means I was strong enough and did have energy enough to go faster on the last two legs but, all the factors combined, meant I couldn't utilize on this strength and energy. I have found my emotions all over the place since the round. Everyone is congratulating me and so I should be happy. I am cross with myself because things went wrong that shouldn't have gone wrong. But overall it was the heat that finished me off. Walking round the farm in 26C it seems incomprehensible that I ran for two days through that sort of heat. I knew it was going to be hot on Saturday and planned for this. I coped well. The forecast for Sunday was clouds and less hot. It just didn't happen. There were no clouds, no breeze and it was energy sapping. I have accepted that 48 hours was an impossible goal in that heat and now celebrate that I did completed a Double Ramsay Round "with variations" as stated on Charlie Ramsay's website. 2) That I was raising money for Odyssey through Justgiving and knew I was nearly at my target. This is a special charity close to my heart as they help people get their life back after having cancer so thank you to everyone that has donated and please donate if you haven't.